Check to see if you're on track to meet your college savings goals. It's never too early to think about college savings. What percent of the cost do you expect to cover from savings? 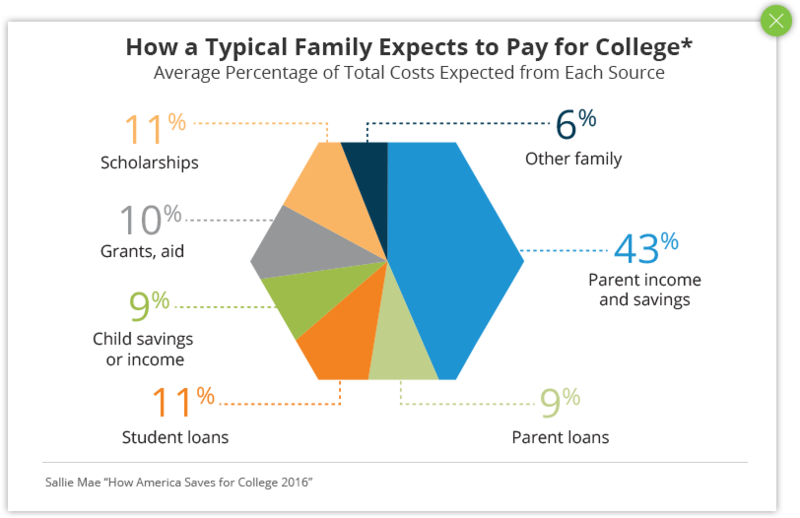 View this chart to see how the typical family pays for college. How much do you have saved so far? Include any savings in a 529 plan, savings accounts and other investments intended for college tuition. How much are you currently saving for college each month? You are on track to meet 55% of your college savings goal. Get closer to your goalCongratulations! You are currently saving $100/month. See how adding a little extra to your savings each month can get you closer to meeting your goal. and exceeding your savings goal by 31%. Adjust your monthly savings below or change the parameters above to see the impact on your plan. For help getting back on track, visit the Savings for College section on Fidelity.com for college savings articles, ideas, tools, and resources. You can compare your options, see how much you'll need to save, and find an account that meets your needs. Keep up the great work and continue to save to meet your goal. Check out our Planning and Guidance Center for help in keeping your college savings on course. The analysis models a hypothetical investor's savings behavior in different market scenarios. The calculator combines the user's inputs with assumptions about the length of college payments as well as the growth of college costs. The user-indicated current savings and contributions, along with future savings amounts input by the user are then projected based on Fidelity's assumed rates of return and volatility based on historical annual data from 1926 through the most recent year-end data available from Morningstar Stocks (domestic and foreign), bonds, and short-term are represented by S&P 500®, U.S. Intermediate Term Government Bonds, and 30-day U.S. Treasury bill, respectively. The calculator assumes indicated savings start immediately and continue until the hypothetical student is finished with school. The spending need uses today's cost per year estimate and grows it annually by 3%+ inflation until the expense is incurred over 4 years. General inflation is assumed to be 2.5% annually. The resulting savings level varies by market conditions but the calculator illustrates the potential to meet the spending goal at the 75% confidence level. This means the amount saved meets or exceeds the illustrated savings amount in 75% of the hypothetical market scenarios (with differing market conditions). Conversely, the amount saved may fail to reach the level illustrated and in 25% of the market scenarios. The assumed asset allocation for the analysis uses three asset classes and a generic target date asset allocation appropriate for college savers. Lastly, the underlying effective rates of return are assumed to be between 1% and 3%. As time horizons get closer to the start of college, the return assumptions are reduced to illustrate a generic target date rolldown strategy appropriate for a college savings investor. Estimated "on-track" amounts or savings targets are hypothetical illustrations and do not reflect actual investment results. Potential annual contributions are also illustrative and should not be the sole basis of planning or investment decisions. This analysis and its output do not guarantee future results. Fidelity does not provide legal or tax advice and the information provided above is general in nature and should not be considered legal or tax advice. Consult with an attorney or tax professional regarding your specific legal or tax situation.